The Texas Forest Service keeps a big tree registry that recognizes the largest trees of each tree species in the state. Also, the American Forest's Organization keeps a record of the biggest trees of any one variety in the United States. The trees considered the largest are measured by height, circumference and the spread of the branches. Texas is blessed with some of the largest trees to be found anywhere, including the cottonwood, live oak, bald cypress and pecan trees. Cottonwood trees (Populus deltoides) grow in old streambeds and damp, low-lying areas where there has access to water. Cottonwood can grow in what is considered desert areas fi water is lying below the surface of the ground. The Cottonwood tree is better left in the wild rather than used as a landscape specimen because of its aggressive root system that can destroy sidewalks and crack home foundations. 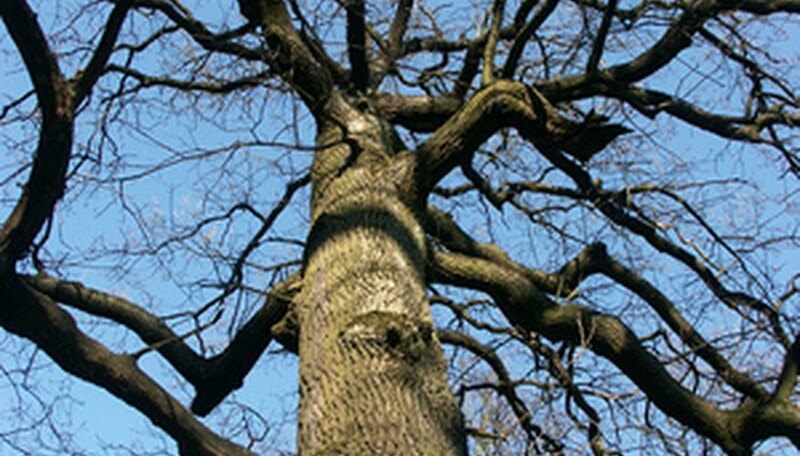 Although Cottonwood trees grow very large, they are weak-wooded, and the wood is commonly used for pulpwood and paper. In Fort Davis, Texas, a Rio Grande cottonwood has a trunk that is 30.6 feet in diameter, 92 feet tall and has a spread of 92 feet. It is listed in the American Forest's National Register as the biggest cottonwood in the United States. A variety of the live oak is native to every part of Texas, and all varieties are drought tolerant once established. They have strong wood that has many different uses, such as cabinet making and wood flooring. Live oaks (Quercus virginiana) are slow-growing trees. An evergreen oak, it creates dense shade during all parts of the year. Live oak trees are a very popular in landscaping in Central Texas because they are easy to grow and have few pests. However, in Central Texas a disease called oak wilt, spread by a beetle attracted to surface wounds on the tree, is damaging a substantial number of live oak and red oak trees. A live oak at Goose Island State Park, known as "The Big Tree" or "The big tree of Lamar" by locals, is thought to be the oldest live oak in the United States. Other live oaks are taller, but at 35 feet around and with a spread of more than 90 feet, "The Big Tree" is considered a Texas treasure. It is thought to be around 1,200 years old. The bald cypress (Taxodium distichum) is native to the swampy areas of East and Central Texas as well as the Gulf coastal plains. In recent years it has been used as a landscaping tree because it is pollution and drought tolerant once established. A unique feature of the bald cypress are the raised knobs produced from the surface roots, known as knees, that can be 3 feet tall in swampy areas where the roots are submerged for long periods of time. The knees do not grow as high in the typical landscape. The wood is used as a long-lasting building material, and in recent years the trees have been used as mulch, creating concerns about erosion and other environmental problems as the trees are harvested from native wetlands. The Texas record for a bald cypress tree resides in Real County. The tree is 96 feet tall and 36-1/2 feet around with a spread of 112 feet. The pecan tree (Carya illinoinensis) is the state tree of Texas. Pecans are widely used in baking and for eating fresh and are found on supermarket shelves throughout the United States. Pecan trees are easy to grow in Texas because they are native. However, for best results, choose a variety that is recommended for the area you live in. To find the varieties recommended for your area, consult you local county agricultural extension office. Purchase trees that are between 6 and 8 feet tall because the tap root that extends below the tree is less developed and there is less chance it is damaged. The record in Texas for the largest pecan tree is held by a behemoth in Parker County. The height of the tree is 91 feet and is 258 inches around. It has a spread of 117 feet.